The Hebrew word translated here as 'deceitful' is aqob (pronounced aw-kobe') and it also means fraudulent, corrupted and polluted. In modern terms you might use it as 'to con' or 'intensely self-serving'. This is the exact same root used in the name 'Jacob' and Jacob's actions toward Esau (not once but twice) gives a very accurate illustration of its practical meaning. In God's judgment, it is disgusting in every sense, as belonging in a moral sewer. This more accurate translation gives new meaning to the perils of the heart, since 'deceitful' simply means 'misleading' or 'to impose a false idea'. The Hebrew term "desperately wicked" is anash (pronounced aw-nash'), and means 'to be frail' or 'feeble', leading to 'incurable sickness'. Elsewhere in scripture God calls it "a heart of stone," as if rigor mortis has set in even though it is still alive and beating. The lesson in this scripture then is this: The human heart (emotion) is so corrupted, so deluded and self-serving that it is, in it's natural state, so weak and feeble in its susceptibility to deceit that it is completely defenseless. The good news is that God will give a new heart to those that yield to Him. However, there are many Christians (including spirit-filled, veteran Christians of many years) that have not yielded completely and as a result there are "ferocious wolves in sheep's clothing" that will feed on unsuspecting sheep. In the secular world we might expect wolves but as Christians we have a tendency to be much more trusting, especially where other Christians are concerned. The problem is that wolves are by nature cunning, clever and sophisticated in their approach. 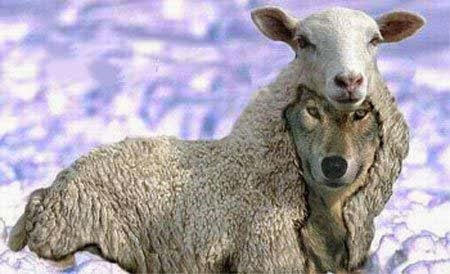 Some may not even be aware that they're a wolf, totally convinced that they're living the righteous life of a sheep, but eventually their true, carnal nature is exposed - but it may be too late for the heart of the sheep. What's worse, the sheep may know deep down that they're dealing with a wolf but think that they can somehow change him or her. But the wolf's heart can only be changed by its creator and the sheep ends up living in bewilderment and delusion.